Peanut brittle gets a new life here as a sweet and savory, crunchy addition to this rich beet curry. Forming it on the baking sheet should be as simple as patting it down with your hands. If you have time to allow it to cool before breaking apart, the crunch will be intensified. The beets are ready when they can be easily pierced with a fork, be careful of staining your cutting board, or anything else for that matter- red beets are notorious for that. **Allergens: Tree Nuts. Processed and packaged in a facility that packages wheat, peanuts, tree nuts & soy. Rinse and dry the produce. Preheat the oven to 425°F. Add the brown basmati rice, 1½ cups water, and a pinch of salt to a small saucepan. Bring to a boil, reduce heat to low, and cook, covered, until all of the water is absorbed and the rice is tender, about 30 to 35 minutes. Peel and slice the onion. Peel the red beets and cut into bite sized pieces. Halve the cauliflower florets. Add 1 tbsp vegetable oil to a large pot over medium heat. Once hot, add the sliced onion and cook until translucent, about 4 to 5 minutes. Add the red beets and stir. Add the curry powder and cauliflower florets to the large pot and cook another 2 to 3 minutes to toast the spices. Add 2 ½ cups water and bring curry to a boil. Reduce heat to medium-low, cover, and simmer until vegetables are tender, about 20 to 25 minutes. Lightly grease a baking sheet with 1 tsp vegetable oil. Finely chop the peanuts. Add to a small bowl with the agave, hemp seeds, and flaxseed meal. Sprinkle with salt and pepper and mix well to combine. On a baking sheet, form the brittle into a flat square or circle about ¼ inch tall. Bake until golden brown, about 15 to 18 minutes. Add the Coconut Cloud to the beet curry, stir, and reduce heat to low. Thinly slice the scallion. Finely chop the cilantro leaves and tender stems. Halve the lime and squeeze half into the curry and season with salt and pepper. Cut the remaining lime half into wedges. 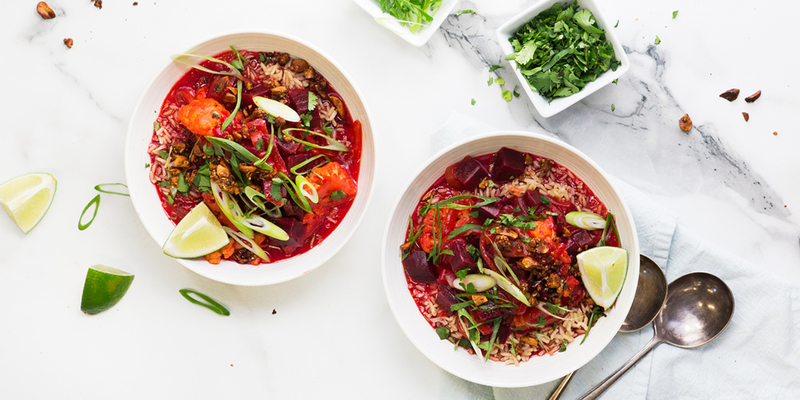 Divide the brown basmati rice between large shallow bowls and top with roasted beet curry. Sprinkle with peanut brittle, scallion, and cilantro. Serve with lime wedges.